Happy New Year Dandelion House friends! Ham is one of our favorite holiday meats. Not just any old ham will do. 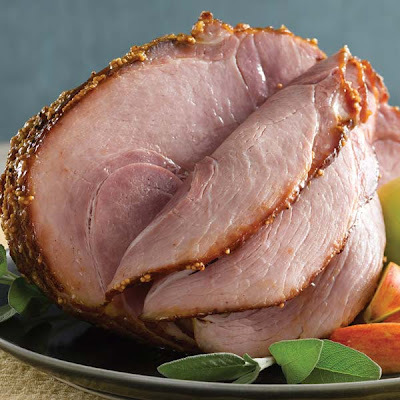 Spiral Cut Honey Ham is simply the best when it comes to flavor, preparation and serving. Not to mention the great meals you can create with the left overs, if you have any that is. Our three favorite brands are Honey Mountain Ham, Trader Joes and Cooks Ham. Read on for days of simple, tasty Ham dishes sure to make your after holiday cooking a breeze and delicious too! 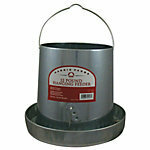 Day One: Serve your spiral ham warm or cold depending on the type of gathering you are having. If you are having a sit down meal with all the trimming's then cook your ham following the package directions. Just grazing? Simply cut off the already sliced pieces of ham, arrange them on a platter and gussy it up with some pineapple and maraschino cherries! Day two: Ham and homemade Mac and Cheese with country style veggies and freshly cut pineapple on the side. Day three: Split Pea Soup served with homemade bread. Day four: Ham and Cheese omelet ( we like a mix of jack and cheddar cheese ) with home fries, sour dough toast and fruit juice. Fresh strawberries on the side. Day five: What to do with that ham bone? When I was growing up my mom used to cook a big pot of pinto beans in her pressure cooker with a nice big ham bone for added flavor and plenty of salt and pepper. If you don't feel like cooking your beans from scratch, buy them in the can, ( a low sodium/organic variety ) pop them in the crock pot with the ham bone and let it simmer all day. Serve with honey corn bread and a fresh Shrimp salad for a lazy winters day supper. Here's my moms Shrimp salad recipe. Rinse and drain lettuce in strainer. Cut lettuce into chunks and add to salad bowl. Cut cherry tomatoes in half and add to lettuce. Rinse and drain shrimp then squeeze some lemon juice on top. Add shrimp and mayonnaise to salad mixture and toss until all ingredients are covered. Serve immediately alongside a nice bowl of steaming hot beans. And there you have it...Ham for Days! What do you do with your left over ham? I'm off to start a pot of beans! HAPPY NEW YEAR and welcome back to the Farmgirl Friday blog hop friends! It was nice to take a little break from our weekly gathering but, I missed you! Can you believe this is the last one for 2011? I so enjoyed my visits with you over the holidays. I think I gained 5 lbs just reading about your holiday baked goods! YUM! What better way to end the year than to add another " good read " to your list! Mary Jane is giving away the book " How Green Was My Valley " over on her blog Raising Jane. If you visit Mary Jane and enter her giveaway, please let her know I sent you! She's new to blogging and I know she'll get a kick out of hearing from you! Now it's your turn to link up for your weekly dose of farmgirl soul- food! I think I love the first few days after Christmas even more than the days leading up to it. It feels good to have the hustle bustle behind me, to slow down and savoir quiet moments here at home with my family. I'm still enjoying the tree, and all our holiday decorations too. Soon enough it will be time to put it all away and move on with a New Year. As always, I have BIG PLANS a brewin' but I'm not ready to hatch them just yet. I'm still relishing our cozy nest and this welcomed breather. Here are some of the highlights of our homemade Christmas this year! Our daughter crocheted two scarves for her grandmother's and a pretty little coin purse for me with a fancy sparkly button. Our son created homemade cards (with sweet sentiments written inside each one ) made with wall-paper samples destined for the trash before Boz scooped them up knowing they would make for some thrifty and elegant wrapping paper! We had a vintage photo of my husbands father's family homestead from 1924 retouched and enlarged for family members and one for ourselves too. I gave a few bundles of Dandelion House note cards as gifts too! 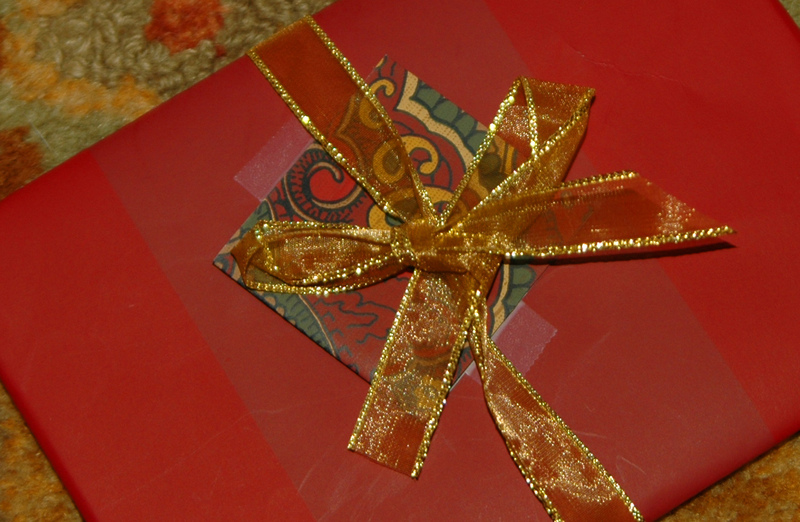 The best gifts are those made with human hands straight from the heart. Having the time to relax and enjoy them is even better! Here's hoping you are catching your breath from a busy holiday season and finding time to enjoy each other and the comforts of home. Max is diggin' the down time too!
" The Spirit Remains "
Merry Christmas Eve to all! Thank you for your visits and kind words throughout the year! May the Spirit of Christmas remain with you long after Christmas! 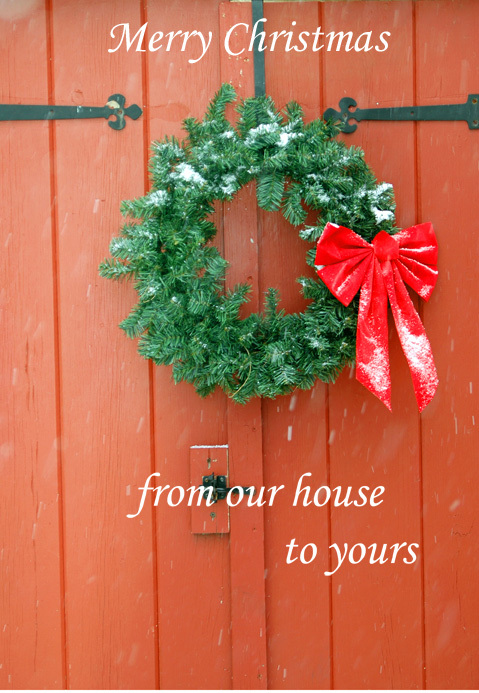 In lou of our regular Farmgirl Friday link- up this week, you are invited to my Christmas Wishes and Dishes OPEN HOUSE at MJF beachfarmgirl blog! If you get chance, stop by for some Saltine Toffee Cookies and find out how long Santa Clause and I have had a " thing "! Merry Christmas and all Joys for a Happy Healthy New Year! Deb, Boz , the teens , Max and " The Cottage Hens ". 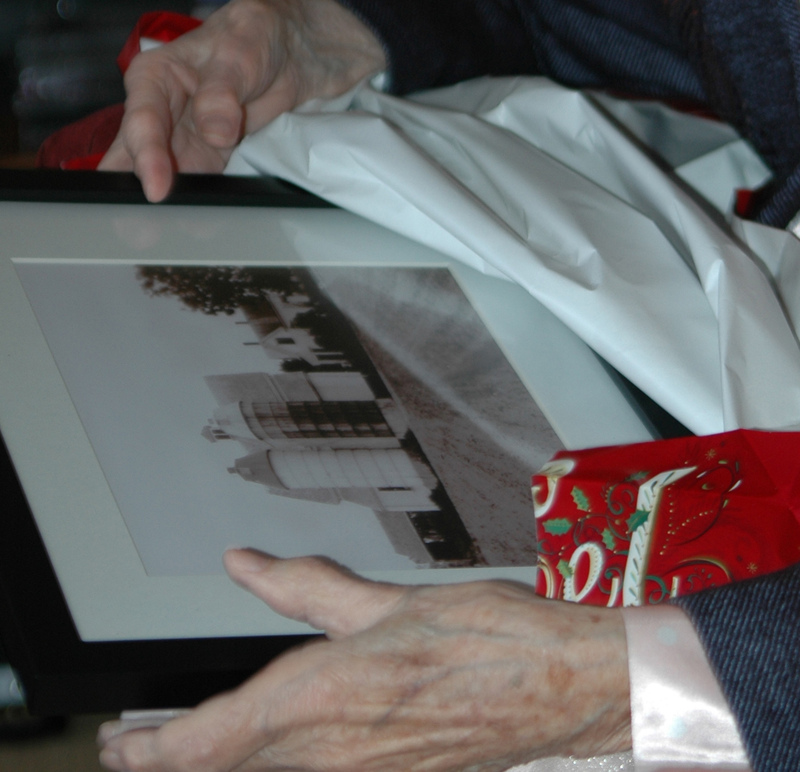 for winning my holiday giveaway, Christmas on the Farm! Thank you all for your entries and for following, and remember, if you didn't win, you can click over to Amazon or drive over to your local TSC ( Tractor Supply Co. ) and pick up a copy for yourself and your farmgirl friends for Christmas! Time just seems to be flying by between Farmgirl Friday's doesn't it? 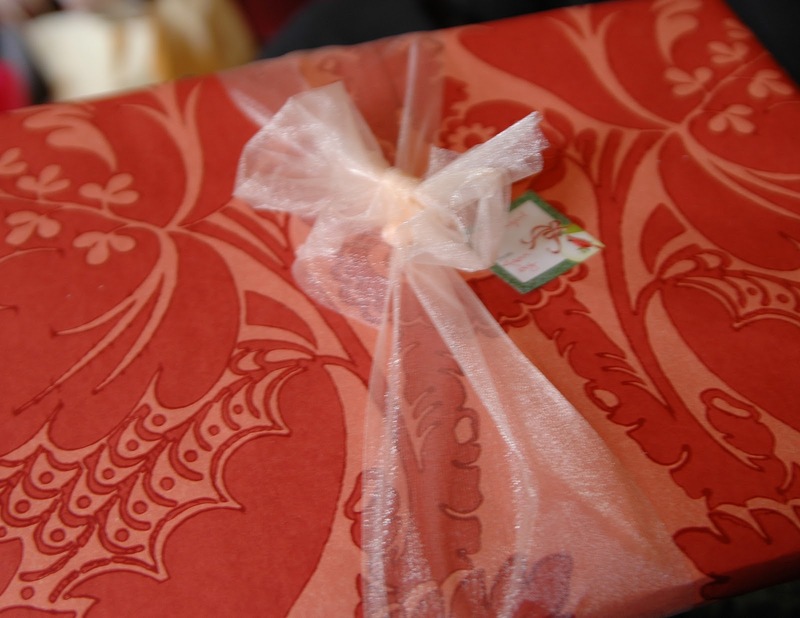 With so much last minute gift shopping, wrapping, decorating, baking etc. it's no wonder. Before we get on with the hop, I want to take a minute to welcome all new followers who have joined us in the last month! We are so glad you are here and joining in on Farmgirl Friday's and sharing your thoughts in the comment box too! I'm also thrilled to see we have 30 entries for my giveaway Christmas ON THE FARM book.! It is a treasure! I found it at our local Tractor Store that just opened up! Boy howdy, did I have fun there! Hubby went with me and we grabbed a few things for the Cottage Hens and for Mother Hen too! What did I get? I got a new egg collecting basket, and my first ever plaid flannel western shirt! They also had some great belts with lots of sparkles on the buckle which I'm still thinking about. I know, for you " farmgirls " that get to shop at the Tractor Store all the time you are probably wondering what all the excitement is about, but it was just so refreshing to find some of the things I needed to make my farmgirl chores easier and more fun too! This will be perfect for the spring chicks who have grown up so fast! I picked up this cute RED egg collecting basket with coated wire to protect all those backyard farm fresh eggs we'll be getting next spring. And who wouldn't enjoy gardening, raking and weeding wearing a pair of hot pink gardening gloves? Plus, you can even get this wonderful book I'm giving away there too! There's still a chance you can win! Click HERE to enter! I think a gift card to the Tractor Store is a PERFECT gift for your " farmgirl " friends. Don't you? 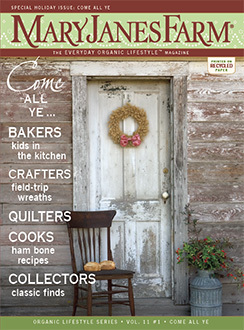 One of my favorite gifts to give is a subscription to MaryJanesFarm Magazine! It's full of farmgirl fun all year long! Don't for get to link up for your weekly dose of Farmgirl soul food too! 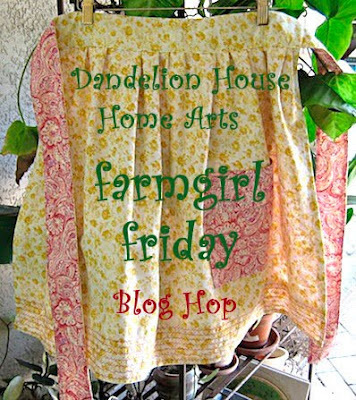 This will be the last Farmgirl Friday Hop until 2012... THANK YOU all for being such a loyal group of " blog hopper's" . Because of you, our community is growing; we get to laugh, learn, perspire and be inspired every week! I will continue to host each Friday in 2012 so enjoy the break and we'll be back together before you know it! Ranch farmgirl blogger for A Farmgirl Christmas. This is such a busy time for everyone as we count down to Christmas. If you're like me, you're still shopping, or finishing up last minute handmade items as well as planning menu's and standing in line at the post office too! All in the name of Christmas; the most joyous time of the year! We can all use a little help in our planning so I'm offering you a chance to win this charming book Christmas ON THE FARM. A collection of favorite recipes, stories, gift ideas, and decorating tips from The Farmers' Wife; the original Magazine from the early 1900's. This wonderful book is a treasure trove of old fashioned ideas for a frugal, and loving homemade Christmas celebration. I've been reading my copy over the last few days and have fallen in love with it and I want one of YOU to have a copy too! 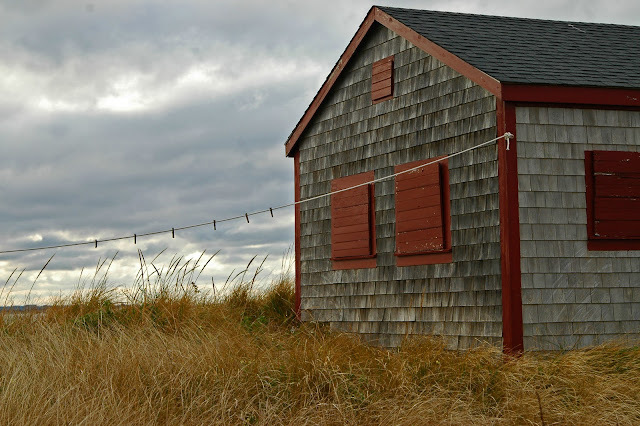 It's my way of saying THANK YOU for being a part of the Dandelion House community! You make me laugh, inspire me with your amazing talents and give me that warm fuzzy feeling when you leave a note on my door! TO ENTER: Please leave a comment telling me you wish to be entered in my giveaway. If you are new to my blog, join us any way you wish... Follow, Subscribe by email, Face Book or Network Blogs. Be sure to let me know if you're new and have followed so I can come to your blog too! PS. I got my copy at the Tractor Supply and it's also available from Amazon.com! Here is where you get to link up for your favorite blog hop and your weekly dose of farmgirl soul food! Each week your entries are more intriguing than the last! There's always something new and inspiring to get your creative juices flowing inside and out! Did you make it by to see the cool green house Kelsie ( from Our Country Home blog ) and her husband built from reclaimed windows? Amazing and resourceful too! If any of you are learning how to cook " New Meats" (OLD MEATS) like venison, do yourself a favor and visit Kelly's of Bees, Birds, Berries and Blooms blog for a wonderful recipe on Venison Roast. I personally am not a hunter, but I am considering keeping chickens " meaties " for meat. If any of you are I say go for it! Especially you farmgirls out there. Our dear MaryJaneButter's hunts and grew up hunting with her large family. My brother and sister in law hunt every year and this year, guess what I am getting them for Christmas? A Cook Book for cooking Elk and Deer. I visited Amazon to research what was on the market and I had no idea I would have so many choices. Can anyone recommend a good one? If, so leave me a note and have a wonderful week! PS. 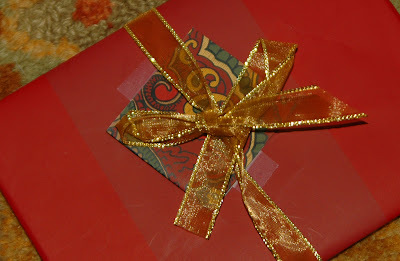 Be sure to come by my MaryJanesFarm Beachfarmgirlblog for this weeks entry " A Coastal Christmas "! Join me for a day of old fashioned window shopping by the sea in my latest post A Coastal Christmas on the MaryJanesFarm MJF Beach farmgirl blog! Hope to see you there! Get our your knitting needles! Is this the most adorable thing you've ever seen? A friend shared this image with me on face book today and I just had to post it for you too! It's from Shelburne Farm located in Vermont! I confess, I don't knit and there was no pattern included with this fun face book wall post. 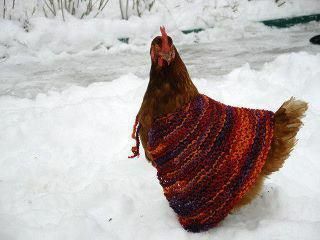 But, something tells me my knitting friends could probably figure it out... Just a little tailoring trip to the Chicken Coop for measuring and you'll be ready to go! Have a happy urban, suburban, city, mountain, rural, backyard, beachy FARM day friends! 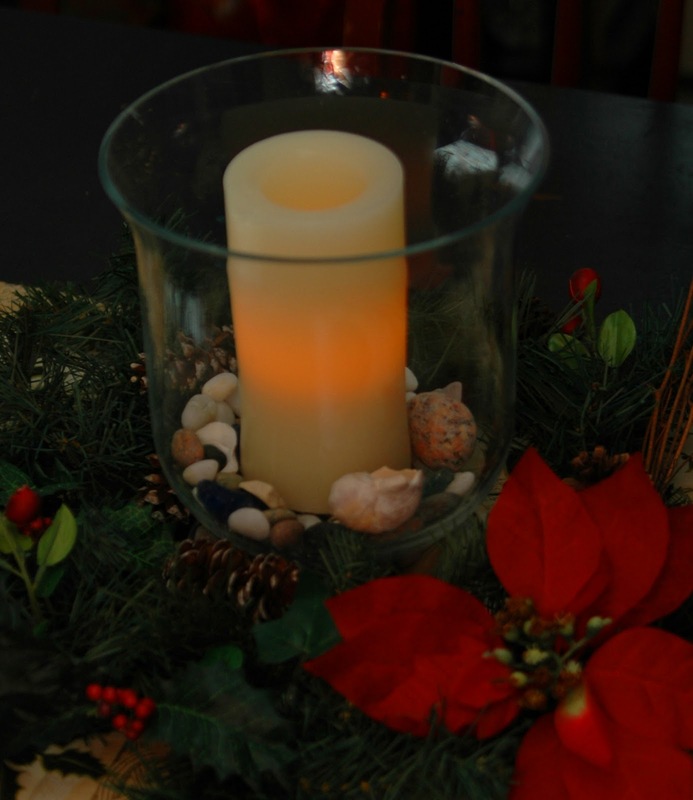 Here's a quick and easy way to bring some coastal flair to your holiday decorating! Purchase some sea shells from Michaels Craft Store, grab your glue gun and get going! You can glue your shells onto a fake evergreen wreath or a live one. Plan an arrangement you like and just glue. I love the mixture of traditional pine-cones and seashells together! 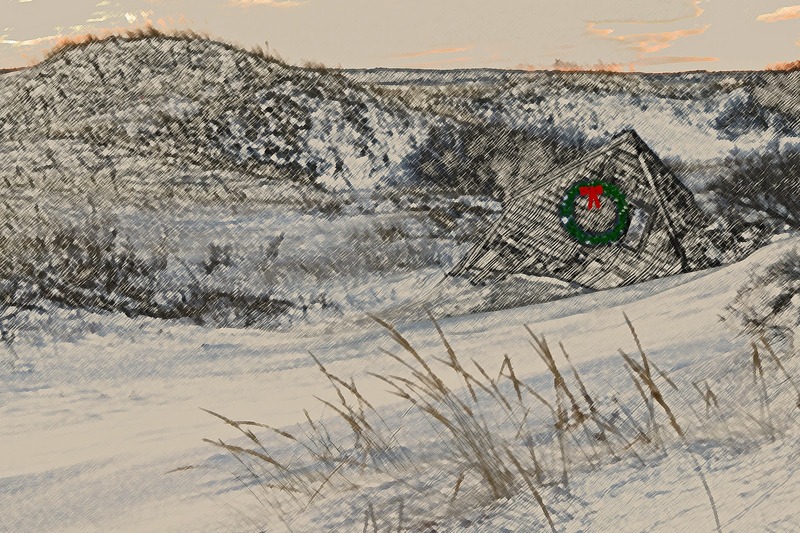 Stay tuned for more Seaside Christmas decorating ideas! I'll be back next Saturday with a Saturday Scene's Special Post! I like this caption, but does this image say something else to you? Please share! Woo hoo! It's Farmgirl Friday and the first day of December! The month of all things bright! I've yet to begin decorating for Christmas ( well, except for the evergreen wreath I hung on the hen house today that doesn't even have a bow yet ) but, I'm starting to " feel " it... You know, the spirit of Christmas. Yesterday, I had to go down town for an appointment ( yeah, my weekly date with my chiropractor ) and things were hopping! The Town of Plymouth does a tree lighting ceremony every year and I got a peak at the guys high up in the bucket truck stringing lights in preparation for tomorrows festivities. Wreaths had been hung on the lamp posts that dot main street and small shop windows were clad in Christmas cheer! Well, that was all I needed to get me in the mood! Stay tuned. I'm dreamin' up a new twist on my holiday decorating theme this year! I think you're gonna love it! If you're new to this hop welcome and please join in! If you've been hopping with us for a while, great to have you here again and thanks so much for all you share. Oh, before we get going, do any of you bread making farmgirls have a favorite brand of bread maker ( besides your two hands ) ?